What Were the 1st Words Spoken by Alexander Graham Bell Over the Telephone? Alexander Graham Bell was born in Edinburgh, Scotland in 1847 and was an eminent engineer, scientist and researcher who was looking for ways to develop hearing devices to help the deaf. Both his mother and wife were deaf; Bell was relentlessly involved, as were his father and grandfather before him, in inventing devices that would give the gift of sound to those who couldn't hear. 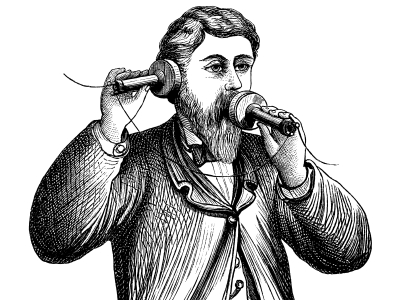 So how did a man obsessed with hearing devices develop the telephone? As a child, Bell showed a gift for invention, having created a husking machine at a farm that was in use years later. In return, the farmer gave Bell and his brothers a small workshop wherein they could work on their inventions. Bell invented a "harmonic telegraph," for which he received a patent. By this time, his parents had moved to Canada, then Boston, and Bell was heavily invested in his invention processes. He came up with the idea of sending tones on a wire with a device similar to a tuning fork, a sensation that got him funding from wealthy supporters. By 1876, Bell obtained a patent for an "acoustical telegraph," the forerunner of his first telephone. The device would transmit sounds telegraphically by "electrical undulations." Using a liquid transmitter, the diaphragm of the device vibrated, causing the same vibrations of a needle in water, which changed the electrical circuit to simulate speech. Bell's assistant, Thomas Watson, was in a nearby room in Bell's workshop, waiting to see if Bell's device would work. Bell spoke these famous words into his device: "Mr. Watson, come here. I want to see you." Watson heard the words clearly and distinctly, and thus, the first working model of a telephone was born. Although there were other inventors working on similar designs, including one whose patent application was almost on the same day as Bell submitted his, Bell's invention was the first actual working telephonic device. So, the 1st words spoken by Alexander Graham Bell over the device were a summons to his assistant; and those words changed the history of mankind. Around the age of 12, Bell's mother began to lose her hearing. Bell working tirelessly on coming up with new ways to communicate with her, including a system of tapping in her palm, and speaking to her by putting his lips to her forehead. His mother could feel the sound vibrations of his voice fairly well, and that success caused him to devote himself to studying elocution, the study of the spoken word. Bell and his brothers came across an automaton at a fair that fascinated them. The automaton could speak a few words by blowing air from a bellows over a fashioned larynx. Spurred on by their father, the Bell boys made their own automaton that could also speak a few sounds. Bell thought he had developed a breakthrough after translating the German book of a scientist who was working on articulating sound. Bell found out, after drafting a paper on the topic, that another scientist had already done the same thing, which disappointed Bell greatly. But once he began to carefully translate yet another German work on the subject, he discovered that it was his faulty translation that caused him to skip over the possibilities of electricity in mimicking sound. That discovery, he said, caused him to rethink the entire theory he had on how sound could be created - this time, by using electricity to move sound patterns. The mistaken translation, Bell said, made him devise a means that he might've missed if he had translated the first book correctly. This led to the invention of the "acoutical telegraph." "What Were the 1st Words Spoken by Alexander Graham Bell Over the Telephone?." YourDictionary, n.d. Web. 20 April 2019. <https://quotes.yourdictionary.com/articles/what-were-the-1st-words-spoken-by-alexander-graham-bell-over-the-telephone.html>. Alexander Graham Bell was born in Edinburgh, Scotland in 1847 and was an eminent engineer, scientist and researcher who was looking for ways to develop hearing devices to help the deaf. Both his mother and wife were deaf; Bell was relentlessly involved, as were his father and grandfather before him, in inventing devices that would give the gift of sound to those who couldn’t hear. Who Said “When One Door Closes Another Opens"?